Translating a character from a comic book to anything else can be a bit tricky. If someone’s making the big jump and going from comic to live action, anything is possible, from something amazing like Christopher Reeve’s Superman or Robert Downey, Jr’s Iron Man, to something a bit lacking, like Halle Berry’s Catwoman or X-Men Origins: Wolverine. So, I had mixed feelings when I heard that the CW, former home of Smallville, was starting a new hero-based live action show based on a character I’ve always really liked: DC Comics’ Green Arrow. That last change I’ve heard a rumor about and I’ll recount it here. Recent superhero outings at the movies that have had less than stellar box office returns include Green Hornet and Green Lantern. The theory I heard was the “green” adjective leading in was now more or less box office poison, and so they changed the name to just “Arrow.” I have no idea if that’s true, but it’s at least semi-plausible. On the good side, I’ve seen images and read articles that make it look like some other characters I’ve always liked will show up. Dinah Lance, better known in the comics as Black Canary, has long been Ollie’s big love interest. They’ve cast someone as Dinah, so hopefully a version of Canary will be forthcoming. I’ll be doing a separate piece later on Canary’s triumphs and failures in video over the years. Other characters of interest include “Tommy Merlyn,” no doubt some variation on GA’s biggest recurring foe, Merlyn; Jessica De Gouw as the Huntress (in some realities, Batman’s daughter AND one of Black Canary’s best friends), and Michael Rowe as Deadshot. There’s also a teaser in the trailer of the mask worn by Deathstroke, one of DC Comic’s most fearsome mercenary characters. On the actor end, there are some names I know and am happy to hear. John Barrowman, perhaps best known (at least in some circles) as Captain Jack Harkness of Torchwood and Dr. Who will have a recurring role, yet to be revealed. Paul Blackthorne, who made an amusing Harry Dresden, will be Detective Quentin Lance, Dinah’s father. And Kelly Hu will be playing “China White.” I admit, I’m not sure who that’s supposed to be, but any excuse to watch Kelly Hu is a good thing in my book. 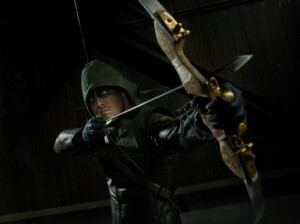 As I write this, Arrow debuts this evening. I’m looking forward to it, and will have a detailed review of the pilot as soon as I can. I’ve always been a fan of heroes in most varieties they come in. When I heard about an online game that allowed you to make up your own, I was curious. 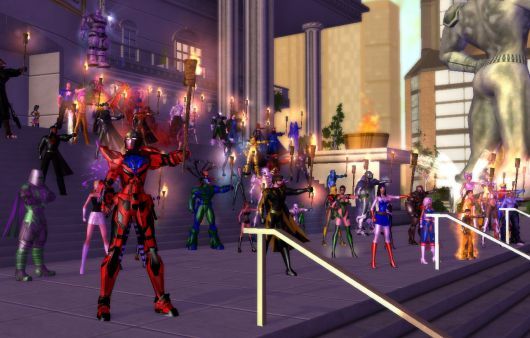 Eventually, I checked it out, and I have been playing City of Heroes for something like eight years now. It’s a great game, they add new content regularly, and have some very creative power-sets if you want to further customize your character. Sadly, NCSoft, the company behind COH (as it’s usually abbreviated), has announced they are closing the game. The reasons behind this seem murky. I’ve read that this is coming because of a “realignment of focus.” This is a great example of corporate speak that doesn’t really say much. Was the game losing money? Was there a management change? Do they simply not like superheroes? No one seems to know. Later, in a report on the site Tom’s Hardware, the company is quoted as saying “… the continued support of the franchise no longer fits with our long term goals for the company.” Again, what does this mean? If the game was just losing money, and this was an economic decision, I’d hate it, but I’d at least somewhat understand it. These vague phrases are making it sound a bit like something more is happening, and they just don’t want to say what it is. The community blog has an odd bit asking us to “not dwell on the ‘how’ or the ‘why…’” Again, to me this sounds like there is a good bit more to the story and we’re just not being let in on it. Have you ever seen something where you’re told not to ask why something is happening and had it turn out to be good news? Making it even odder, the closure was announced suddenly just after a new power set was introduced. It seems really odd to decide to end a game, but then release a new piece of it just days before said announcement. I really can’t help but wonder what happened here. So, if you play a hero, this a chance to, in a small way, be one yourself. Do any or all of the above. Sign the petition, write to the CEO, use Twitter, come up with something else on your own. I’ve enjoyed this game for years, and I know many others have also. There’s a great sense of community among the players I’ve never felt in EverQuest, Star Wars Galaxies, or Star Wars: Old Republic. If you’ve ever played the game, do something to help it. And if you never have? Consider at least signing the petition. After all, heroes don’t just help people they know, now do they?